Our main dining area is located off the main bar and reception area. It is spacious, comfortable and stylish which begs to offer a memorable and unique dining experience. ** Please read our booking & cancellation policies below before making a booking. 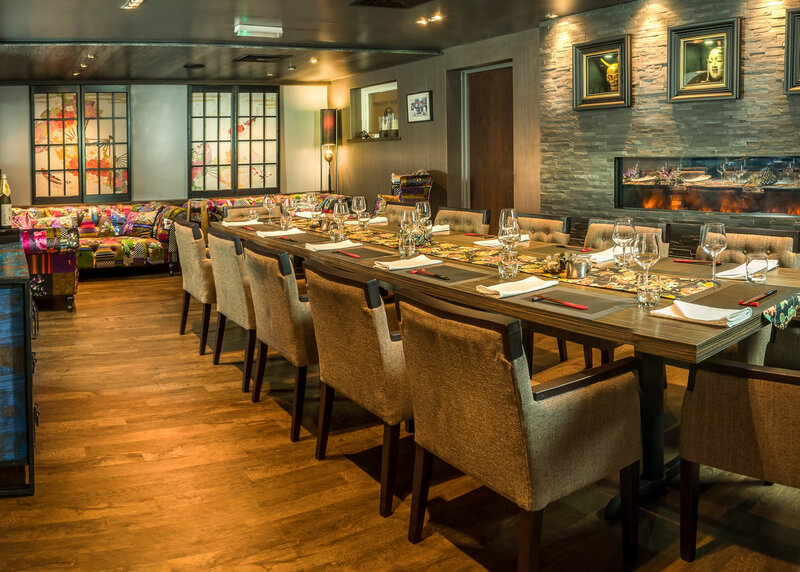 Our exclusive semi-private dining area at Ogino is different and above all impressive. Planned bespoke menus, party requirements and extras can all be effortlessly taken care of by us for that special event. Ogino respectfully request that all bookings are limited to a 1hr 45mins. For parties of 6 or more the time allowed is increased to 2hrs 30mins. If you wish to have pre-dinner drinks please kindly make arrangements to arrive early and allow sufficient time to be seated. We politely request that you are ready to be seated at the time of your reservation. Should you arrive after your booking time, we may need to hold you back to a later time to ensure the best possible level of service is offered to all our guests. Please note that parties of 8 or more must be booked by telephone were a £5/ guest non-refundable deposit will be required. It should be noted that for tables of 10 or more we will ask for a food pre-order to ensure a smooth service. If you are unable to attend, please call the restaurant (01482 679500) as soon as possible to allow us to allocate the table for other guests. * If you are going to be late to your reservation, please contact the restaurant at your earliest convenience. The company policy is to call you if you are more than 10 minutes late, we automatically cancel bookings that are 20 minutes late. We are happy to present your celebratory cake, write a message, decorate with candles, provide plates and cut your cake for you at the table. Please note we do apply a small service charge of £1.00 per person if customers have chosen not order a dessert from our menu but would like to consume the celebratory cake instead.